Mama Toscano’s Ravioli & Deli – I had the honor and privilege of sitting down with Nick and Patty of “Mama Tascono’s” this past week. Rarely in this day and time do you see the devotion to family, integrity and honor as I witnessed. This is a fourth generation family owned business that has changed and adapted to service their customers without sacrificing quality. The building has been in the family for over 90 years. The changes that they have made have only been for the better. Their philosophy is treat people the way you would want to be treated! This theory is definitely working for them as they rank among the top deli’s/restaurants in St Louis. From a grocery store to a wholesale and retail market, they haven’t changed a whole lot. Nana Kate started making ravioli upstairs, and they moved it downstairs to accommodate the demand. Hand making 250 lbs of ravioli a day is quite a chore, especially when you consider that it is a 3 day process. I actually got to see everyone in the kitchen working, and it’s truly an art! 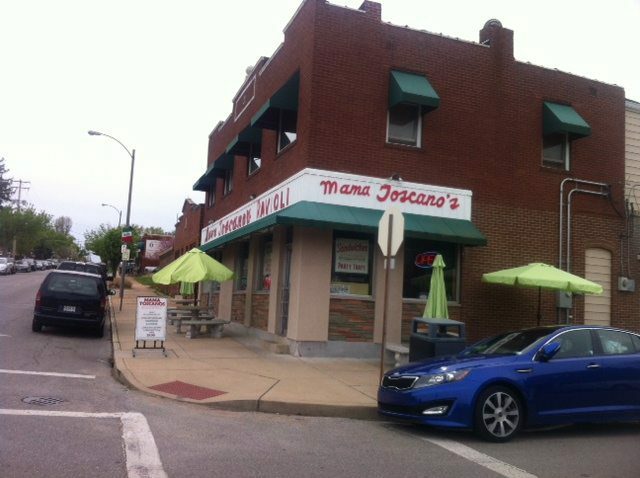 Many St Louis restaurants buy toasted ravioli from Mama Toscano’s Ravioli & Deli. They are inspected daily by the USDA and buy all of their ingredients locally. They sell their food world wide. They have been featured on the Food Network “The best thing I ever ate!” and in local magazines and on several television stations. They also have some of the highest ratings on several online sites such as Facebook 4.8,Tripadvisor 4 star ranked 969 out of 2503 restaurants, Google 4.2, Urbanspoon 90% and Yelp is a 5 Star, etc.. Having said all that, it appears that none of these things have gone to their heads. It was refreshing to see a couple so passionate about their food, their business and each other. Additionally, Mama Toscano’s was just chosen #8, Italian sandwich contestant for a contest ran by the St. Post-Dispatch. Refer to the article titled “Which favorite sandwiches are still in the game? Play now!” We encourage you to participate. Visit Mama’s and try their “Italian Poor Boy Sandwich.” You’ll want to vote for it – trust me! Please play, please vote for Mama Toscano’s Ravioli & Deli’s Italian Poor Boy Sandwich. I got to sample one of their biggest sellers, the toasted ravioli’s, and of course they were wonderful. They keep it simple and continue to use family recipes and by the way, the breading on the toasted ravioli, is Patty’s recipe! I can’t imagine any Italian restaurant selling machine made ravioli, that’s just wrong! The difference is obvious. To my surprise they had a few other items that I fell in love with. If you haven’t tried their pizza ravioli’s, made with their homemade Italian sausage or the fried meatball sandwich (sliced meatballs battered and fried) you are missing out! They were both fabulous and what a fun twist on traditional Italian food. I loved visiting with Nick and Patty, they are a testament to family and tradition. Thanks so much! We recommend this hidden gem. Whether you’re looking to take home a taste of “The Hill” to share with your family or just stopping in for a sandwich, you can’t go wrong eating at this deli that puts many St Louis restaurants to shame. We give this deli a 4.75 Star Rating. This post was originally published May 13, 2014, revised and republished February 14, 2015.